Tens of thousands of households in Europe want to give him any more, others regard it with skepticism and distrust. 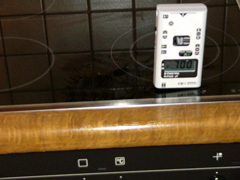 Stoves with induction hobs are on the rise. Technology enthusiasts will see the benefits in the rapid heating of food and in a precise allocation of energy without wastage. The burning of over boiled around the stove is eliminated because only the area of the pan is heated. So, no more scrubbing and mopping! This entry was posted in emf and tagged cooking, frequency, induction hob, kilohertz, magnetic field, pregnant women, stove on 2012/11/11 by joachim-w.